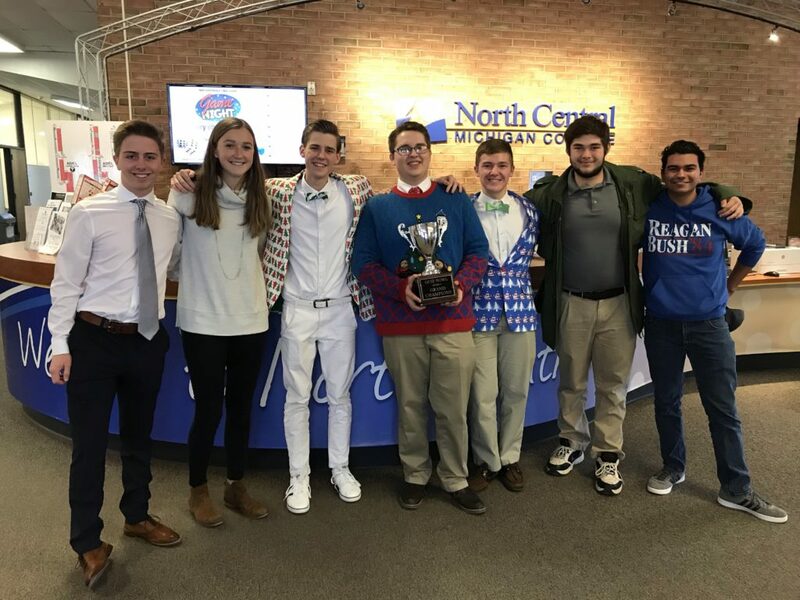 PETOSKEY – With just five points separating each team at the end of the final match, the Petoskey A team squeaked by a very competitive East Jordan A team to win the Char-Em Quiz Bowl Championship hosted by North Central Michigan College on Nov. 30, 2018. The day began with morning playoff rounds that revealed three undefeated teams: Petoskey A, East Jordan A and St. Michael Academy A, a previous champion of the first Quiz Bowl tournament held in October. The defending champion, St. Michael Academy B, also qualified for the afternoon semifinals as an at-large selection on total points. Both East Jordan and Petoskey moved on in the winner’s bracket in close matches against each of the teams from St. Michael Academy. The consolation bracket saw St. Michael Academy A team re-establish its dominance over St. Michael Academy B team. Central Lake A and B teams finished the day in the upper division in fifth and sixth place, respectively. Other teams who participated included Charlevoix, Boyne City, Ellsworth, Concord Academy Boyne and Concord Academy Petoskey. The next Quiz Bowl tournament will be held at North Central Michigan College on Feb. 1, 2019. The public is welcome to attend. Pictured from left is the championship Petoskey A team: Davis Blint, Genevieve Kromm, James Fordyce, Kristian Reeb, Trent Warren, John Wrobleski and Donimic Moore. Career Academy for Kids set for June 18-20, 2019!